Major infrastructure works to construct a new roundabout on the A702 at Mauricewood have ceased, and are unlikely to commence again soon, after Crummock folded earlier this month. Penicuik’s motorists face months of additional disruption following the news that the £5M construction of a new roundabout on the A702 has ceased. The major roadworks, which commenced at the beginning of March, were due to complete next week but have been marred by hold ups and a “substantial increase in cost” pushing the end date to the Autumn. However the collapse of the Bonnyrigg based principal contractor Crummock has now thrown the project into doubt with developer Taylor Wimpey admitting that they “must wait on matters to be resolved with the receiver” before work can recommence. We are aware of the recent news that Crummock Scotland has gone into receivership. They were the principal contractor involved in a project to deliver the construction of a new roundabout to replace the existing T-junction at the A702 and Mauricewood Road intersection near Penicuik in Midlothian. In the immediate short-term, as the lead developer on the project, we have ensured the current traffic management system will remain in place until matters are resolved with the receiver and we have secured the compound area… We are working hard to ensure that any disruption is kept to a minimum and we will provide a further update when the works can be restarted to complete the project. 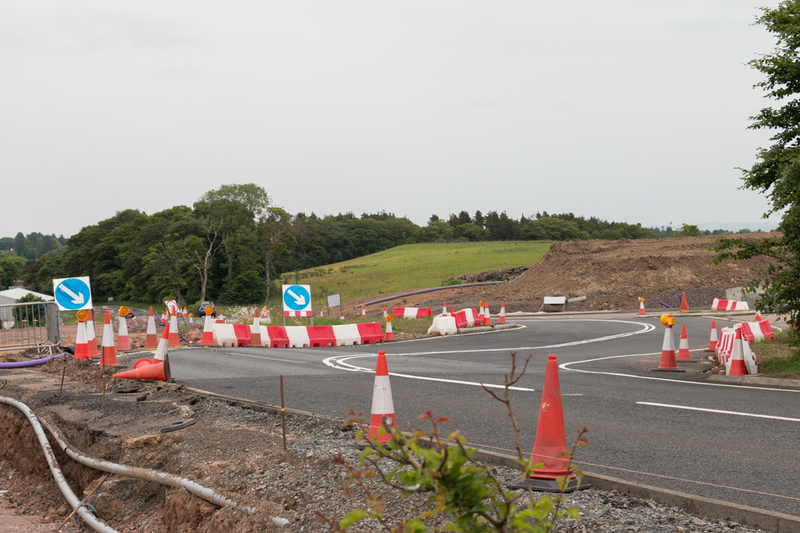 The roundabout is required to facilitate the construction of over one thousand new homes in north west Penicuik and is being jointly funded by the housing developers as part of their developer contributions. The road upgrade must be delivered before the bulk of the new homes can be constructed, with planning conditions prohibiting mass development before the infrastructure’s capacity is increased. Taylor Wimpey has confirmed that they have sought to vary this condition, allowing them to construct an additional 25 homes before the roundabout is operational. This would allow them to have 75 occupied homes, in addition to 25 soon to be under construction homes in Avant Home’s new neighbouring development. In a letter to the council, the developer’s lawyers say that both Transport Scotland and Midlothian agree that the road network can withstand the additional traffic until the new junction is delivered. However, the delivery of the roundabout is now in doubt, with no work allowed to recommence until the receivership process is complete and a new principal contractor has been appointed. This is likely to add months to the known three month hold up, meaning that it is unlikely the roundabout will be fully operational by the end of the year. Crummock’s 287 employees have been laid off after the civil engineering firm called in the receivers, citing “cash flow” problems. The company had rapidly been taking on additional work, with yearly growth in excess of £1M, however it is understood that they were unable to generate enough capital to meet their debts. Crummock is a well known name in Midlothian and they have provided Midlothian Council with their services for over thirty years. Within the past year, Crummock has been involved in contracts with the council up to the value of £2.1M. It is unclear whether the council were aware of the company’s financial position when granting the contracts. Crummock were brought onto the roundabout project in January 2018, replacing the national civil engineering firm Farrans who had undertaken the preliminary works with Scottish Water at the end of 2017.